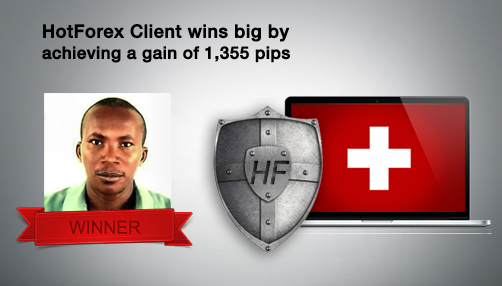 HotForex client wins big by achieving a gain of 1,355 pips in few seconds while selling USDCHF. HotForex is pleased to announce that many of our clients profited from the volatility caused by the Swiss National Bank’s sudden reversal of the Swiss franc cap. We would like to congratulate Ayodele Odingboro, who, with an impressive 1,355 pips in profit ranked first among HotForex clients trading CHF pairs on that day.